Leading up to its grand opening in Pacific Commons on February 8, The Halal Guys has been a highly anticipated addition to the Fremont food scene. The New-York-City-based food chain is well-known for its unique blend of Mediterranean and Middle Eastern cuisine— and this new location certainly lives up to the reputation. The Halal Guys offers two main entrees — gyros and platters — with three protein options: beef, chicken, and falafel. The white tzatziki sauce, golden rice, and flavored beef made for a delicious combination, bursting with flavor. The extra hot sauce gave the food a kick meant only for the bravest taste buds. The falafel, on the other hand, was extremely dry and tasteless. The restaurant offers sides of hummus and baba ghanouj as well, the latter of which is a wonderfully creamy blend of roasted eggplant and garlic. For the most part, The Halal Guys provides food with an authentic taste that can’t be found anywhere else. The food is definitely tasty — there’s no doubt about that. But the prices are well over $10 for any item of substance, and the portion size of the meat does not match its price point. Though there is plenty of salad and pita on the side to keep a hungry customer satisfied, it doesn’t feel as if one is getting the full value for their money. Customers seem to be paying just as much for the name as they are for the food, which could be justified if everything else was up to par as well. 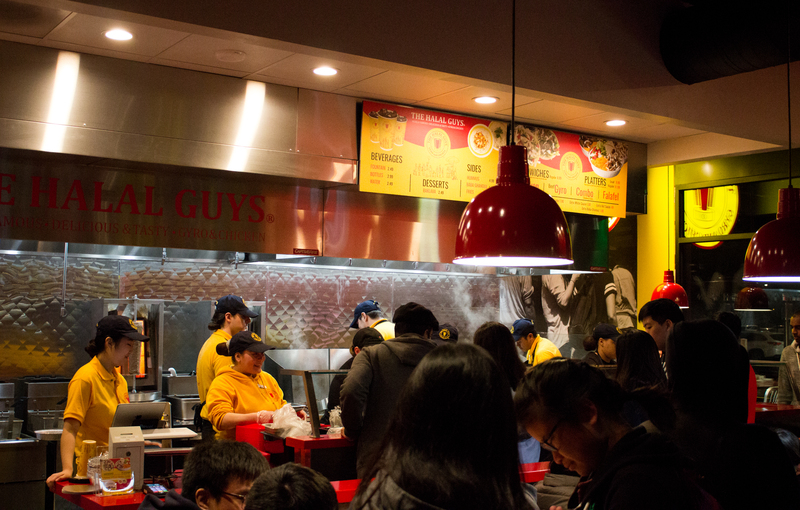 The Halal Guys operates as most fast food restaurants do, with customers ordering and paying at the counter. Unfortunately, that means it also suffers the same pitfalls that plague nearly every fast food establishment — overcrowding, long lines, and messiness. For the most part, however, The Halal Guys does a good job of combating the first two issues; even with the grand opening rush, the line moved fairly quickly and it was relatively easy to secure a table. Cleanliness, though, is a problem. With customers taking tables as others leave instead of being seated like at a sit-down restaurant, there’s always some food scraps left behind, be it a stray few pieces of lettuce or a forgotten utensil. It’s certainly nothing major, but it does make the dining experience slightly less enjoyable. 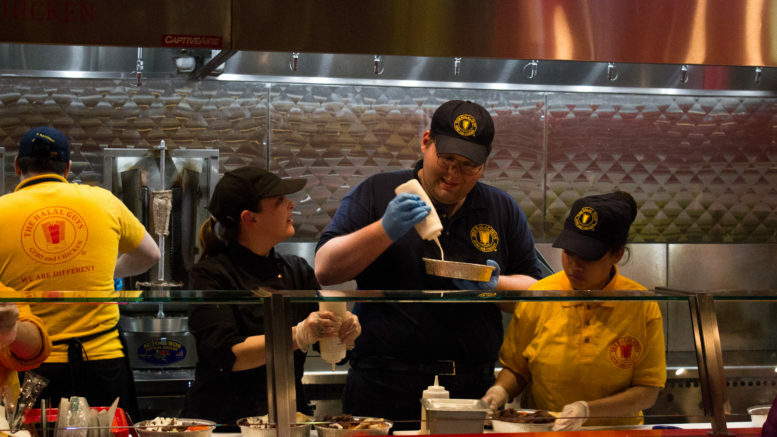 The employees were sociable and considerate as they bustled around the restaurant and happily answered questions about the history of The Halal Guys. Service was quick and efficient as the servers took less than a minute to put together a single gyro or platter. The servers cheerfully accommodated any specific food requests while they made the orders and were ready to give explanations and recommendations on the various sauces and toppings. In addition, a server handed out water cups to customers waiting in line to make their dining process more efficient. 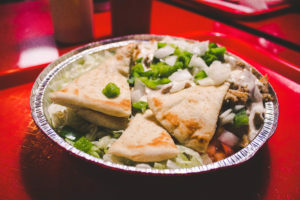 It’s the little things like this that make the experience at The Halal Guys and leave restaurant-goers eager to return. 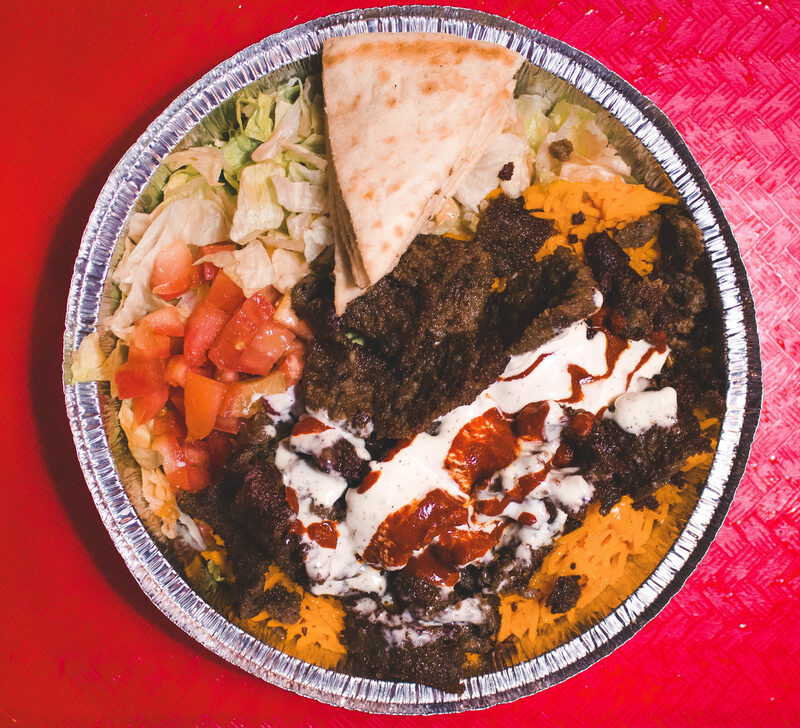 Be the first to comment on "The Halal Guys: A Fresh Take on Middle Eastern Cuisine"